The Insider Monkey team has completed processing the quarterly 13F filings for the June quarter submitted by the hedge funds and other money managers included in our extensive database. Most hedge fund investors endured a torrid quarter, which certainly propelled them to adjust their equity holdings so as to maintain the desired risk profile. As a result, the relevancy of these public filings and their content is indisputable, as they may reveal numerous high-potential stocks. The following article will discuss the smart money sentiment towards Illinois Tool Works Inc. (NYSE:ITW). Hedge fund sentiment towards Illinois Tool Works Inc. (NYSE:ITW) fell sharply for the second straight quarter in Q2, as their ownership of the stock dropped by 26%. 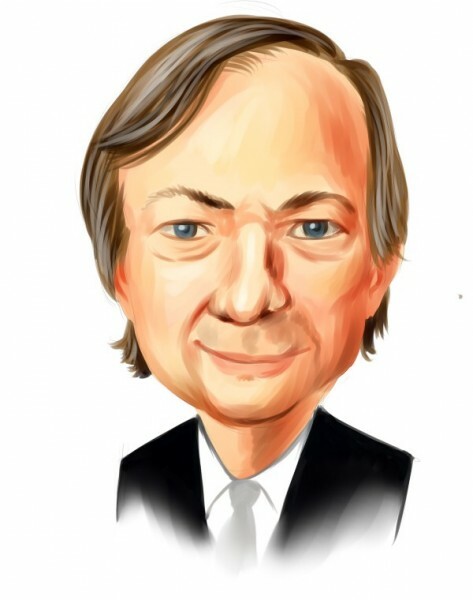 After selling off over half of its position in Q1, Ray Dalio’s Bridgewater Associates sold the rest of it off in Q2. Illinois Tool Works does have a nice looking dividend, which has been paid out for 44 consecutive years and currently yields 3.14% annually. That ranked it 12th on our list of the 25 Best Dividend Stocks for Retirement. How have hedgies been trading Illinois Tool Works Inc. (NYSE:ITW)? At Q3’s end, a total of 28 of the hedge funds tracked by Insider Monkey held long positions in this stock, a fall of 13% from the previous quarter. 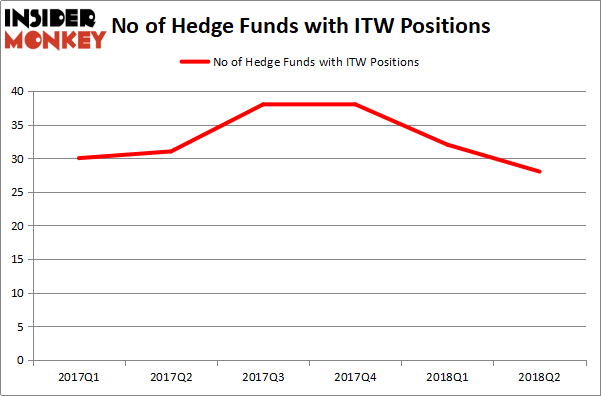 The graph below displays the number of hedge funds with bullish positions in ITW over the last 6 quarters. With hedge funds’ positions undergoing their usual ebb and flow, there exists a select group of notable hedge fund managers who were boosting their stakes substantially (or already accumulated large positions). According to Insider Monkey’s hedge fund database, Phill Gross and Robert Atchinson’s Adage Capital Management has the biggest position in Illinois Tool Works Inc. (NYSE:ITW), worth close to $119.9 million, corresponding to 0.3% of its total 13F portfolio. Sitting at the No. 2 spot is Renaissance Technologies, led by Jim Simons, holding a $109.8 million position; 0.1% of its 13F portfolio is allocated to the company. Some other hedge funds and institutional investors with similar optimism include Seth Rosen’s Nitorum Capital, John W. Rogers’s Ariel Investments and Greg Poole’s Echo Street Capital Management. Because Illinois Tool Works Inc. (NYSE:ITW) has experienced declining sentiment from hedge fund managers, logic holds that there lies a certain “tier” of funds that slashed their full holdings heading into Q3. At the top of the heap, Peter Rathjens, Bruce Clarke and John Campbell’s Arrowstreet Capital dropped the biggest investment of the 700 funds followed by Insider Monkey, totaling about $55.4 million in stock, and Alexander Mitchell’s Scopus Asset Management was right behind this move, as the fund sold off about $29.1 million worth. These bearish behaviors are interesting, as total hedge fund interest was cut by 4 funds heading into Q3. Let’s now review hedge fund activity in other stocks similar to Illinois Tool Works Inc. (NYSE:ITW). These stocks are The Southern Company (NYSE:SO), Banco Bilbao Vizcaya Argentaria SA (ADR) (NYSE:BBVA), Applied Materials, Inc. (NASDAQ:AMAT), and ABB Ltd (ADR) (NYSE:ABB). This group of stocks’ market valuations are closest to ITW’s market valuation. As you can see these stocks had an average of 21 hedge funds with bullish positions and the average amount invested in these stocks was $722 million. That figure was $607 million in ITW’s case. Applied Materials, Inc. (NASDAQ:AMAT) is the most popular stock in this table. On the other hand Banco Bilbao Vizcaya Argentaria SA (ADR) (NYSE:BBVA) is the least popular one with only 5 bullish hedge fund positions. Illinois Tool Works Inc. (NYSE:ITW) is not the most popular stock in this group but hedge fund interest is still above average, though declining rapidly. This is a slightly positive signal but we’d rather spend our time researching stocks that hedge funds are piling on, although we do love the dividend history.